For your convenience, Dr. Steinsapir has compiled a list of the most commonly asked questions about cosmetic Asian eyelid surgery (blepharoplasty). If your question is not answered below, please do not hesitate to contact our private practice facility, located in Beverly Hills, California. We look forward to speaking with you, and are always available to answer any questions or concerns you may have. What should I know about Asian eyelid surgery? Double fold surgery is not about Westernizing the eyelid. Double fold surgery is about creating definition in the upper eyelid. Revisional and corrective upper eyelid surgery for the Asian eyelid must preserve and enhance the natural character of the eye whether you have a double fold or no fold. It is essential that your potential surgeon carefully listens to your concerns and help you to understand what is possible so that the two of you can arrive at an appropriate individual treatment plan. Your doctor should have extensive experience treating a wide range of concerns for diverse eyes and should have an extensive portfolio featuring before-and-after Asian eyelid surgery photos that demonstrate a versatile surgical skillset. Make sure that your doctor has a strong educational and fellowship background, as well as years of experience specializing in various forms of cosmetic and reconstructive eyelid surgeries. An expert in treating aesthetic facial concerns will be able to ensure that the results of your Los Angeles Asian eyelid surgery blend harmoniously with the rest of your features. 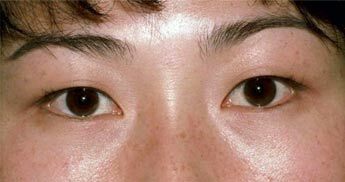 What should I know about ptosis and Asian eyelids? Eyelid ptosis is a relatively common concern, for which effective treatment is available. 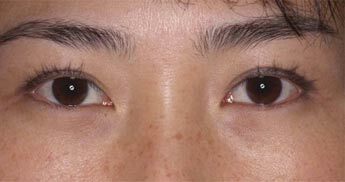 Patients of Asian descent who are seeking corrective measures for eyelid ptosis should ensure that their potential oculoplastic surgeon appreciates the unique qualities of their eyes and eschews standardized “cookie cutter” plans, instead electing to design customized treatment plans that take into account each patient’s individual circumstances, facial structure, and aesthetic goals. Asian eyelid surgery is a specialized type of eyelid surgery that, like other cosmetic eye procedures, is truly an art form. Your eye surgeon must have the keen ability to perceive subtle characteristics that make your eyes and facial structure distinctive, the talent to design a treatment plan that addresses these features, and the skill to provide natural results and a fast healing time. Effective treatment for Asian eyelid ptosis must correct existing problems by enhancing the natural qualities of the eyelid contour. In other words, correcting ptosis of the Asian eyelid is in no way about “westernizing” the eye, which is why you should talk to your doctor about his or her treatment philosophy prior to undergoing any form of eyelid surgery. What are the most common causes of unsatisfactory Asian eyelid surgery outcomes? There are many types of Asian eyelid surgery that can greatly improve one’s appearance, including, but not limited to: Asian blepharoplasty, Asian canthoplasty, and double eyelid surgery. To get optimal results from these procedures it is essential to have the surgery performed by a specialized eye plastic surgeon with experience treating concerns similar to yours. Your surgeon should customize your treatment based on your individual needs and facial structure, and should consistently strive to produce beautifully natural results that blend harmoniously with the rest of your facial features. In order for your eyelid contours to complement and highlight your facial structure, each Asian eyelid surgery procedure must be carefully planned and carried out, followed by after-care monitoring with an attentive physician. When eyelid surgery is not performed by a leading oculofacial surgeon with specialized training in Asian eyelid surgery, he or she may not have the skillset and experience necessary to achieve your desired outcome. Disappointing Asian eyelid surgery results can occur from poor surgical design or execution and this can stem from inexperience, or misunderstandings about your surgical goals. Doctors who do not understand the importance of conservative surgery may employ overly aggressive surgical techniques that produce an unnatural “surgical look” that is not flattering and makes it apparent that you have had work done. You can usually avoid these situations by taking preventative measures—like seeking the advice of a top oculoplastic surgeon, such as Dr. Steinsapir, who customizes minimally invasive treatments for your specific needs and aesthetic preferences, and who is known for performing some of the finest Asian eyelid surgery Los Angeles has to offer. Can my previous Asian eyelid surgery be fixed? A well-designed and skillfully performed Asian eyelid surgery can transform your look and give you newfound confidence. Unfortunately, there are a few cases when individuals are disappointed with their results—usually due to a lack of expertise and understanding of the best treatment methods. If you have had Asian eyelid surgery in the past but are dissatisfied with your results, Dr. Steinsapir may be able to help with a specialized revisional procedure. During your initial consultation, Dr. Steinsapir will assess your situation, review your current needs, and determine your best options for moving forward. Who can fix Asian eyelid surgery? In most cases, we recommend talking with the surgeon who performed your original procedure, who will likely be happy to address your concerns. However, if your surgeon is not a specialist in Asian eyelid surgery, if the original results indicate a lack of specialized skill, if your relationship with your previous surgeon has deteriorated, or if you lack confidence in your surgeon’s ability to meet your needs, it is a good idea to seek a second opinion. Your revisional Asian eyelid surgery should be performed by cosmetic eye surgeon who understands that every Asian eye is unique, and thus addresses you on an individual basis. Your doctor should understand that there is not one standard approach to Asian eyes, and that just as your original surgery should be customized, any revisional surgery should be carefully planned for your specific needs. Dr. Steinsapir is an expert in both primary Asian eyelid surgery and revisional Asian eyelid surgery. His core practice philosophy is built upon custom-tailored, minimally invasive treatment options that require minimal recovery time and produce beautifully natural results. Dr. Steinsapir has a great deal of experience in assessing unsatisfactory Asian eyelid surgery outcomes, and in many cases is able to achieve an improved result with revisional surgery. I had eyelid surgery in Hong Kong several years ago and they gave me a double fold. At first the results looked good, but a year later almost all of the effects were gone. Is this something that Dr. Steinsapir can fix? It is likely that you had double fold surgery with a threaded suture. These procedures are done very quickly, and in some parts of the world by non-medical providers. To make a lasting crease, it is generally necessary to surgically create a strong attachment between the skin at the crease and the levator aponeurosis (the tendon that raises the upper eyelid). When performed correctly, this surgery typically lasts a lifetime. Dr. Steinsapir is highly skilled at performing revisional eyelid surgery, and has helped many patients improve upon the results of prior eyelid surgery procedures. A consultation with Dr. Steinsapir will help to determine whether or not you are a good candidate for revision eyelid surgery.